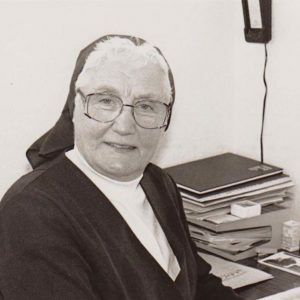 Sister Eileen, a Daughter of Charity of St Vincent de Paul, established out of nothing, except a block of condemned flats, the Charity that is NOAH Enterprise. Her vocation and her heart were in the service of the poor and she was unstinting, dynamic, passionate, compassionate, loving and undaunted in pursuing and delivering it. Her faith was her anchor and her trust in God her compass. In April 1987 Sr Eileen came to Luton on her way to her Community in Bristol. She came to give some service to a Parish in Luton for 6 weeks. She ended up staying 13 years! She saw the poverty in Luton, particularly street homelessness. In conversations with others about this, she was offered the use of a block of condemned flats. Without any money she took up the offer and moved in with her then sole supporter, Sister Antoinette, a nun of the community of the Franciscan order of the Sisters of St Claire. When the flats were about to be demolished in 1991, the Council who had seen the value of the work, offered an alternative site on a peppercorn rent. Sister Eileen moved into 141 Park Street, Luton LU1 3HG in October 1991. The project had been known as the Luton Irish Advisory Bureau but was re-titled in 1993 to ‘The Luton Day Centre for the Homeless’ in recognition that this better reflected the work that was now undertaken. The range of people helping extended to embrace other socially excluded people including street homeless, those suffering from alcohol dependency, drug and other substance misuse, physical/mental abuse, asylum seekers, those released into the community from mental health institutions or prison as well as those socially excluded through isolation. Referrals come by way of the Police, Probation, Health and Social Services, and personal recommendation as well as through other voluntary agencies. Training courses for our clients were introduced in October 1994, leading to the establishment of a dedicated training centre in High Town Road in the Autumn of 1996 which specialised in craft skills (carpentry), basic and life skills (literacy and numeracy). The Training Centre was run in conjunction with Dunstable College, now Central Bedfordshire College. 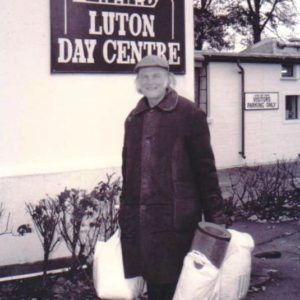 In September 1999, recognising that many of the people we supported were progressing, and were sensitive about the perceived stigma associated with the term “homeless”, the name of the project was changed from The Luton Day Centre for the Homeless and re-launched as NOAH Enterprise. This, it was felt, more accurately reflected the philosophy and ethos of the service as reflected in the intent behind the name, New Opportunities and Horizons. 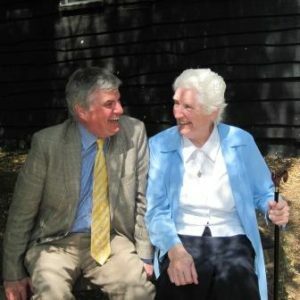 Sister Eileen retired in 2000 at the sprightly young age of 75 and Jim O’Connor, himself part of the Vincentian family as a member of the St Vincent de Paul Society, picked up the reins. In 2003 our expanding furniture recycling/re-use activity relocated to larger premises in Power Court, Church Street. From a small shop of 800 sq. ft., we now trade from a building of some 20,000 sq. ft. Turnover increased accordingly but more importantly the number of people to whom we have been able to offer work experience and skills training has grown from 2 to 200 in any given year. They include those we support through our welfare programme and others in the local community who are long-term unemployed; all benefit from new found self-confidence, self-esteem and self-respect. This holistic approach geared to improving the quality of life of those among the most disadvantaged in our community has had, in many instances, an amazing impact that are witnessed in several of our own case studies. Most lately, in 2014, we introduced our Academy to provide a bridge between work experience and practical skills training to employment. Courses in English as a second language, digital learning and preparation for employment assist people in moving towards and into employment. NOAH provides a pathway from the streets to employment. You can join that pathway at any point. You can travel it in part or fully. You might leave the pathway but you can always re-join it. NOAH is a place of endless chances.